are based on the recent events around the country and world. This section play an important role in scoring. 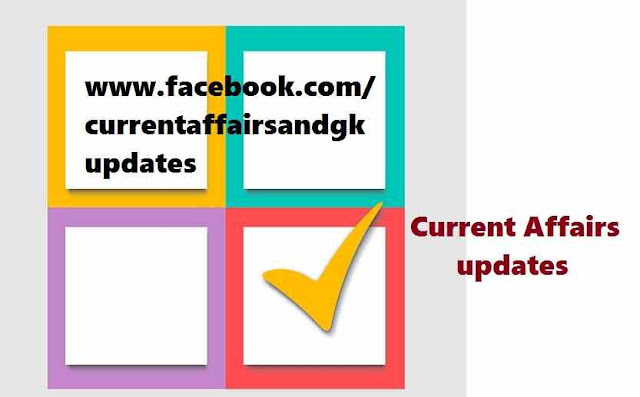 Updates till 12th October 2015 are covered.Updates on 9th October,10th October, 11th October and 12th October are covered. These Updates are very much useful in upcoming recruitment examinations like SSC (Staff Selection Commission), RRB (Railway Recruitment Board),IBPS both Clerk and PO,SBI-RBI-Other Banking examinations,Postal,Insurance and other State level Recruitment Examinations like TSPSC-Telangana State Public Service Commission etc. 1.Anderson Cooper revealed 2015 Top-10 CNN Heroes. CNN heroes celebrates individuals who are doing extraordinary work to improve the lives of others. 2.World Egg Day was celebrated on 9th October this year.World Egg Day is celebrated on every Second Friday of October every year. 3.World Post Day is celebrated every year on 9th October which is an anniversary of the establishment of the Universal Postal Union(UPU) in the year 1874. 4.October-11 is International Day of the Girl Child.This is celebrated to recognize girls' rights and the unique challenges girls face around the world. 5.Khadga Prasad Oli,the leader of Communist Party has been elected as the new Prime Minister of Nepal. for discovering a novel therapy against infections caused by roundworm parasites. for her discovering a novel therapy against Malaria. The Nobel Prize in Literature is awarded to Belarusian author Svetlana Alexievich for her polyphonic writings,a monument to suffering and courage in our time. The Norwegian Nobel Committee has decided that the Nobel Peace Prize is to be awarded to the Tunisian National Dialogue Quartet for their contribution in building a pluralistic democracy (Jasmine Revolution of 2011). 1.Indian National Postal Day is celebrated on 10th October.